I'm trying to figure out how I got this book. I mean I know I got it from the LibraryThing Early Reviewers program, but I don't remember selecting it and it's not normally the kind of book I'd select. That being said, I decided to dive in anyway. 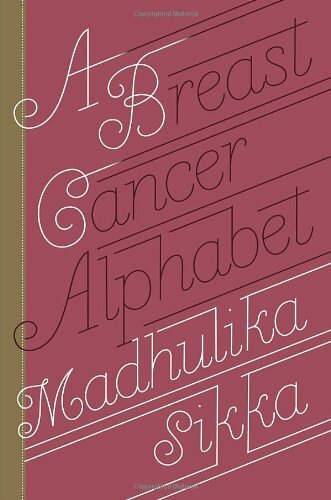 Madhulika Sikka is an editor for NPR News who chronicles her experiences with breast cancer in The Breast Cancer Alphabet. It's not your normal chronicle however. The book is comprised of 26 very small chapters, each a couple of pages long--one for each letter of the alphabet. All the way from "A is for Anxiety" to "Z is for ZZZs." Her intended audience are those women newly diagnosed with breast cancer who are trying to figure out how the hell they just ended up in Cancerland, that "strange land of surgeries, and drugs and side effects, and pain and anxiety, and you didn't even have a minute to prepare for it." Throughout the book you follow Sikka as she chronicles how she learned to deal with her body, her family, her doctors and her pain. Since each chapter is so small, it's easy to get through them quickly. Their brevity also means that they aren't deep, soul-searching kinds of chapters, if that's what you're looking for, but you definitely get a sense of Sikka's initial disorientation and her life during treatment, and the postscript follows her out the other side. Sikka positions her book is as a counter to the idea of the pink-powered warrior that dominates much of the conversation around breast cancer. She argues that she's not a warrior, she's just a woman dealing with a terrible disease, and she counsels her readers that Cancerland is not "a world of fuzzy pink gauze, soft teddy bears, and garlands of ribbons" but a world of indignities that it is "okay to feel indignant about." As I read the book I kept mentally comparing it to The Emperor of All Maladies, which is one of the best non-fiction books that I've read, a real must-read history of the disease, the research behind it, and the attempts to eradicate it. While A Breast Cancer Alphabet doesn't position itself as that sort of book, it gets lost in deciding what kind of book it wants to be--a memoir or a self-help book. Maybe it's because I read the book from the standpoint of a healthy woman (knock on wood), but I found the memoir parts more gripping and wish she had approached the subject solely from that angle.